The Water Taxi Beach at South Street Seaport reopens today for the season. SURF’S UP: It may not have felt terribly summery on NYC’s shores this week, but nevertheless the Water Taxi Beach at South Street Seaport reopens today for the season. 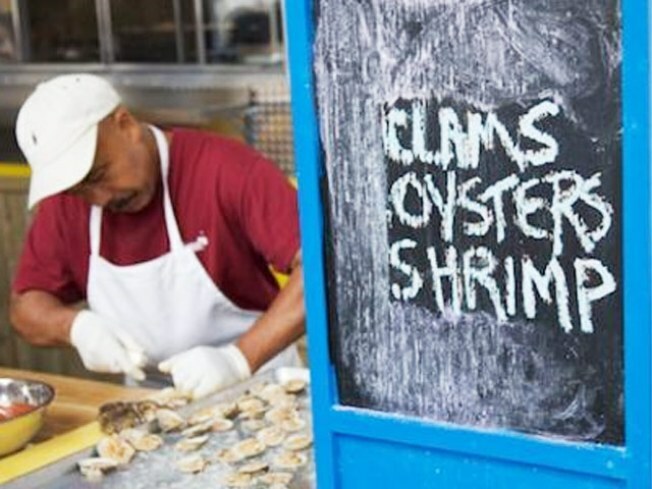 We particularly enjoyed last year’s Eat it Raw Happy Hour on Thursdays and Fridays from 4-6PM, and were’ happy to see it return: Drinks start at a paltry $3, and 80 cents each gets you clams, oysters and peel and east shrimp at the Fish Shack. (Long IslandCity’s WaterTaxiBeach opens on Saturday, and Governor’s Island’s on June 5.) 4PM. GO LONG: OK Go may be all about its awesome, ultra-viral music videos (that treadmill gambit for “Here We Go Again” was just the beginning), but the Chicago-born band can still bring down the house live, sans post-production special effects. Catch them at the Music Hall of Williamsburg tonight (opening: The Booze, and Eytan and the Embassy) at 9PM. TWOFER: Reliably, huggably controversial Janeane Garofalo joins fellow Air America alum Marc Maron—whose skewed, biting perspective now flourishes on his podcast, WTF With Marc Maron—for an evening at Comix where the best part of the show will no doubt be guessing just who in the audience will get offended next. 8PM.